Between 1953 and the early 1960’s Dr. Edward Lewison performed free plastic surgery on inmates of the Okalla prison in Burnaby, BC Canada. It was renamed Lower Mainland Regional Correctional Centre in 1970. The study involved 450 prisoners and was undertaken with the cooperation of Dr. Guy Richmond, the prison doctor, and Hugh Christie, the warden. Dr. Lewison and a sociologist chose patients on the basis of a connection between a “bodily defect” and the inmate’s behaviour. of deformed ears, receding chins and removal of facial scars. centre.” The studies results were published in the Canadian Medical Association Journal in 1965 citing a 42 per cent recidivism rate for the plastic surgery patients vs. 75 per cent for the general inmate population. Lower Mainland Regional Correctional Centre was closed in 1991. The site is now a park. to remove facial and body tattoos to help get them out of gangs into jobs. I have been a I volunteer tattoo removal doctor in Los Angeles since the mid-1990s to help get people out of gangs. The patients pay for their treatments by performing volunteer community services and some have gone on to well paying executive or managerial positions. I don’t think many people today would support free cosmetic surgery for inmates. In this crazy world some would commit crimes just so they could get the free surgery. 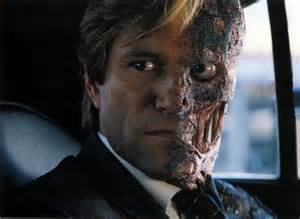 The best way to rehabilitate Two Face back to Harvey Dent would have been Plastic Surgery. The BBC is currently looking for anyone involved to be in a documentary about the study.